This post has been updated to reflect updated odds (as at 31 July 2018). 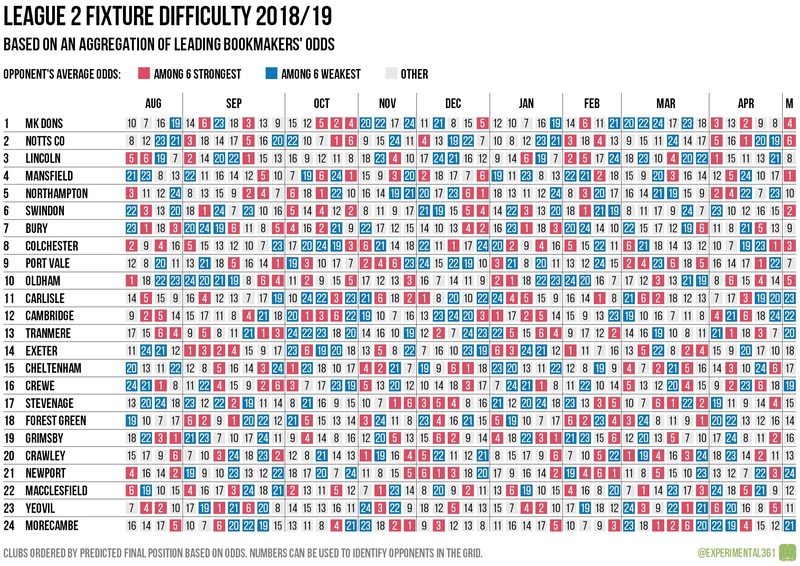 As usual, I’ve taken the newly-released EFL fixtures and combined them with an aggregation of leading bookmakers’ odds (from OddsChecker) to visualise where each club’s tough and easy matches appear to be next season. Each row in the matrix below lists a club’s league matches in chronological order, colour-coded based on how difficult they appear to be and the clubs themselves are sorted and numbered by where the odds imply they’ll finish in the table. I’ve coloured the six strongest-looking clubs (based purely on the odds) in red and the six weakest-looking in blue, but you can use the numbers down the side to identify which fixtures are which.